We know that visualizing a project before it's complete can often be a challenge. 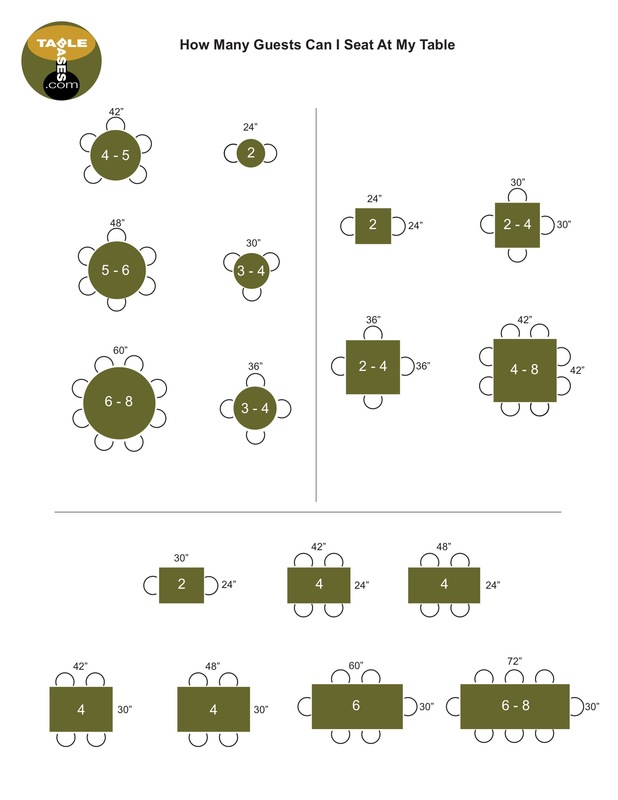 To help you create the perfect table for your space, we've put together a handy little diagram showing how many guests you can fit comfortably different sizes of tables, as well as some handy tips for choosing the best size and shape table for your dining space. While it can sometimes be hard to find a complete dining set in the size and shape you want, with the help of Tablebases.com you can pick your table top, table base, and chairs separately, to find the perfect size and shape for your dining area. Your Room: The first thing you'll want to consider is the size of your dining space. Generally speaking, you'll want to leave about 36" of space around the table, meaning 3 feet between the edge of the table and your walls or furniture pieces. 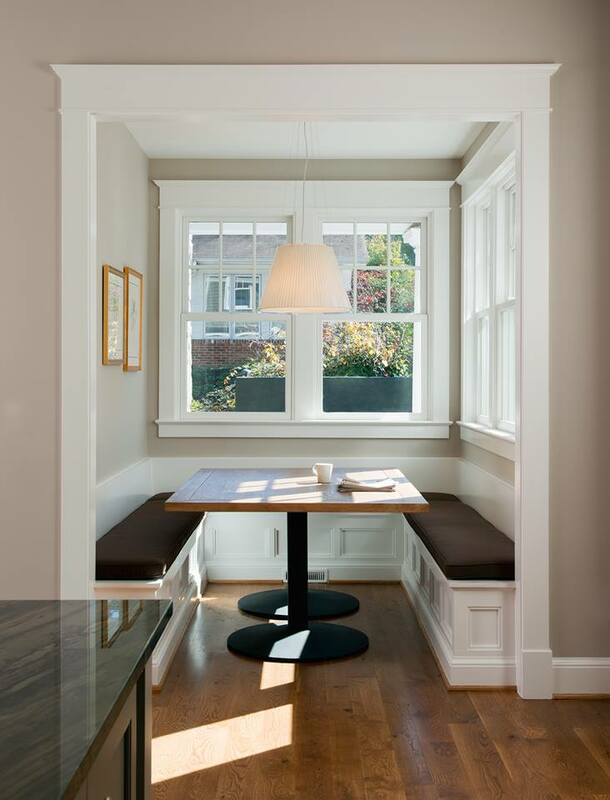 This allows for a good amount of space to move around the table, and makes it easier to pull out chairs and sit or stand without awkward contortionist moves. If you have the space, Gabrielle Di Stefano over at Houzz.com recommends leaving 48" between the edge of the table and the entrance to the room, so your guests aren't squeezing past each other on their way to the table. For example, say you have a 12 foot by 10 foot dining room, with the entrance on the long wall, and you want a rectangular table. At most, you'll want a table that is about 72" long by 36" wide (this allows for 48" between the room entrance and the table, and 36" between the table and other three walls). Make sure to account for other furniture in the room, such as a buffet or drinks cart, and shrink your table accordingly. If you are worried about occasional events such as holidays, where you'll need to seat more people, consider a table that can expand. That way, you'll have good flow around the table most of the time, and only have to squeeze when you really need the extra space for guests. Table Shape: The best shaped table for you will depend on your dining space, what type of entertaining you usually do, and the number of guests you plan to accommodate. Rectangular dining tables are the most traditional and popular choice, but square and round tables are having their moment, especially in open plan spaces. Rectangular tables are the most popular, traditional options for homes, as they tend to fit in standard dining space well and can accommodate a good number of guests. Using the rules of thumb in the "Your Room" section above, you can determine what size rectangular table you can fit in your space. Do not be afraid to go narrower on the width though, as it can actually help create a more intimate dining experience, bringing people closer together. A 28" to 30" wide table can feel very personal and cozy, while wider tables can start to feel a bit more formal. 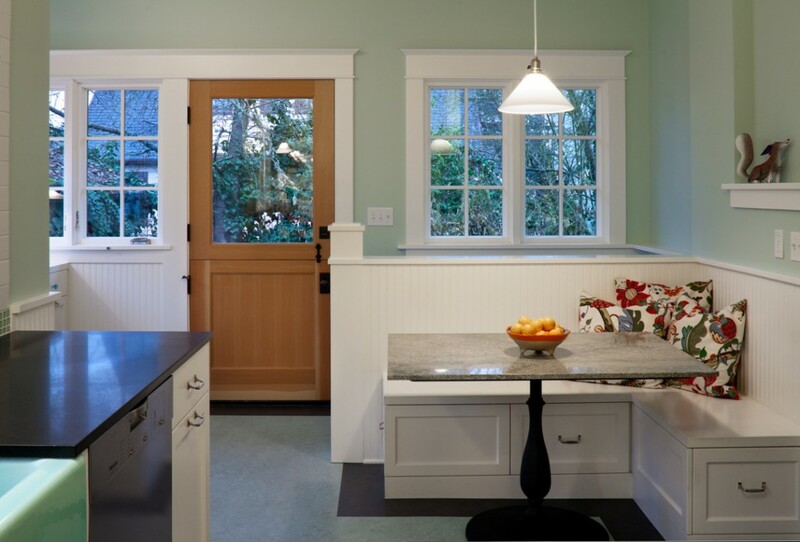 Keep in mind though, if you have a very large space, a narrow table may look undersized. A good starting size for a rectangular table is 60" x 30", with that size, you can accommodate 6 guests comfortably, and a few more in a pinch. Stretching the length to 72" will allow you to comfortably seat 8 people, and increasing the size to 72" x 48" will allow you to comfortably seat 10. If rectangular tables are too angular for your tastes, try an oval shaped table for a softer look. Square tables are very modern and trendy, and work great as counter height or bar height options. Square tables are great for conversation, as you can see everyone around the table easily. Square tables have a great amount of space in the middle, leaving you plenty of room for shared dishes and creative center pieces. Bumping your square table up to counter height (~36") or bar height (~42") can make it feel more unique and casual. Taller tables also work well in open-plan spaces, as their added height helps to visually separate the dining zone without shunning it to a separate room. On the other hand, square tables take up a lot of space, much more than you would think, and can visual dominate a room (though going with a reflective or transparent table top material, such as polished stone or glass, can help make your table seem smaller). While they can be great for conversation since you can see everyone at once, Joanna Tovia over at Houzz.com points out that if your table is too large, it can be hard to hear people on the other side. That extra space in the center can also make it harder to pass dishes across the table. Overall, if you have a large enough space, square tables are an excellent choice. They are less common, therefore more unique, and can make a dramatic statement in your dining space. A compact 36" square table can seat 4 comfortably and fit well in space that's only 6 feet by 6 feet. 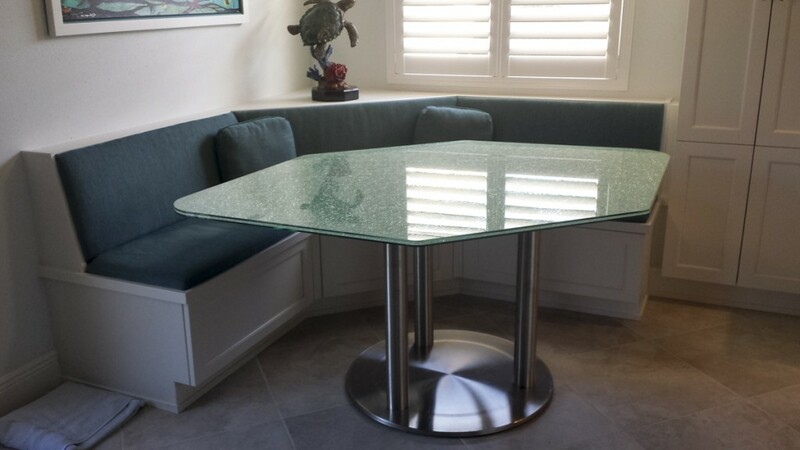 To accommodate 8 guests without squeezing, plan on a table that is at least 48" x 48" (though you can squeeze 8 at a 42" x 42" square table, if you don't mind a bit of elbow bumping). Round tables, like square options, are great for a more intimate dining experience, as you can see and converse with everyone at the table easily. Round tables also have ample room in the center for shared dishes, or a beautiful center piece. The downside to round tables is they are less space efficient, you may have to go with a smaller table or a larger space to make it work. In addition to real space, round tables can take up a good amount of visual space, and like square options, it's easy for them to look too large for your room. A good trick is going with reflective or transparent surface materials, such as polished stone or glass. Those materials will bounce light around to help the space feel less cramped. A 36" diameter table can accommodate 4 people, but it will be a bit of squeeze and you won't have much space for shared dishes. A 48" table can usually accommodate 5-6 people, but for larger groups, you'll want a table that is 60" in diameter or larger. Custom Shapes: Of course, if you want to go for something truly different, you can always have a custom table made! That's the beauty of buying your table base separately, there are endless possibilities! 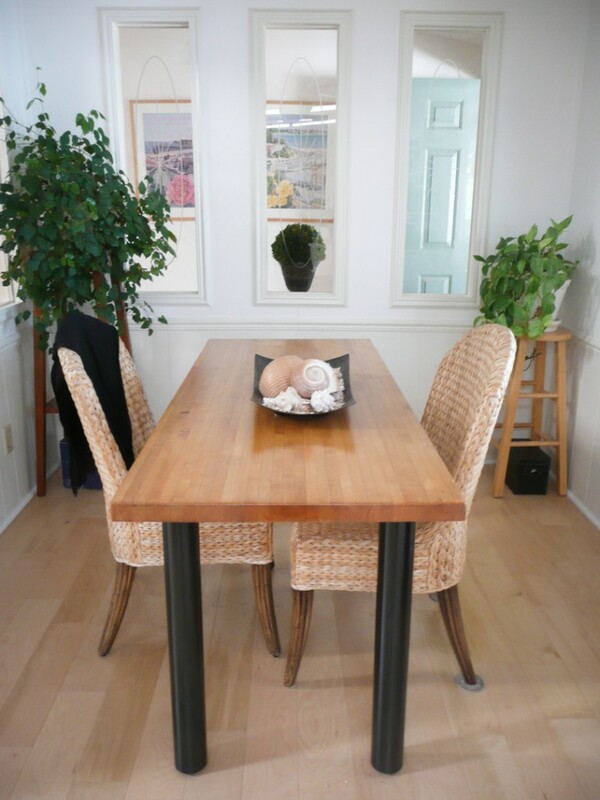 For help picking a base for your custom table, call customer service at 1-800-258-2320. Source: "Which Dining Table Shape Should You Choose? ", "How to Seat Your Guests in Comfort"